Blog - Introducing the Queen's Platinum Wedding Anniversary Commemorative Collection. Introducing the Queen's Platinum Wedding Anniversary Commemorative Collection. This year, Queen Elizabeth II and the Duke of Edinburgh celebrate the 70th anniversary of their marriage. To mark this landmark occasion Royal Crown Derby are proud to announce the launch of The Queen’s Platinum Wedding Anniversary Commemorative Collection. The Royal couple were married on 20th November 1947 at Westminster Abbey; the dress was designed by Norman Hartnell with beautiful detail of star lilies and orange blossoms, and was paid for with ration coupons used in post war Britain. The wedding cake was a wonderful creation of multiple tiers up to 9 feet tall and covered in floral designs with cathedral like carvings designed by Peek Frean a former biscuit making company based in East London. The actual ceremony was recorded and broadcast by BBC Radio to two hundred million people around the world adding to the pomp and celebration making it a truly spectacular event for all. 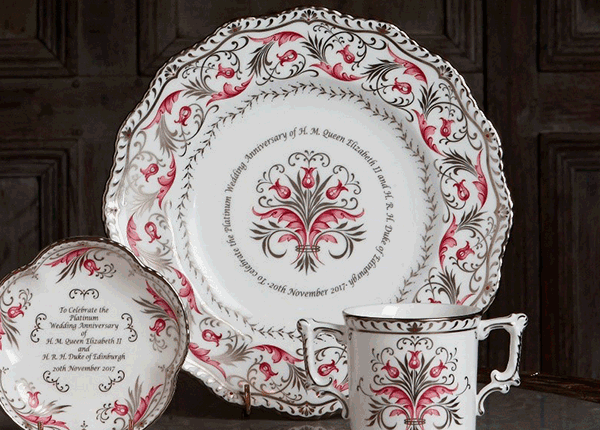 The Queen’s Platinum Wedding Anniversary Commemorative Collection compromises of four breath-taking fine bone china pieces, featuring a beautiful adaptation of the Princess pattern originally designed by Royal Crown Derby to present to the Queen and Prince Philip on the occasion of their marriage in 1947. Flora and fauna inspired motifs in stunning blush pink buds intertwine with flowing vines and leaves in delicate platinum detailing in a regal centrepiece design befitting a Royal celebration. Delicate script adds a perfect celebratory touch with a message commemorating this very special anniversary in beautiful platinum referencing the traditional precious metal which is given to a couple on their 70th wedding anniversary in Britain, making the Platinum Wedding Anniversary Commemorative Collection a truly special one. 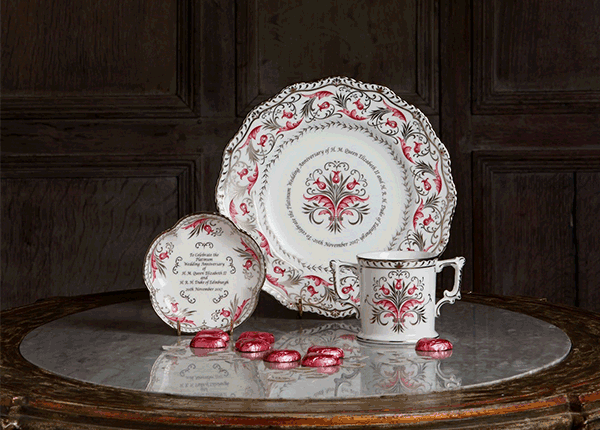 Adorning the Gadroon Plate is a beautiful adaptation of the Princess pattern originally designed by Royal Crown Derby and presented to Queen Elizabeth II and the Duke of Edinburgh on the occasion of their marriage in 1947. The delicate design boasts beautiful flora and fauna motifs in stunning blush pink buds intertwine with flowing vines and leaves in delicate platinum detailing in a regal centrepiece design befitting a royal celebration, featured on the original Princess pattern and the floral designs, which were prevalent throughout the Queen and Prince Philip’s wedding day including detail adapted from the original wedding dress and wedding cake designs. A perfect finishing touch to celebrate this landmark occasion is the script which flows around the beautiful patterned centrepiece in platinum, the traditional precious metal chosen to celebrate a couple’s 70th wedding anniversary in Britain. View The Queen’s Platinum Wedding Anniversary Commemorative Collection Gadroon Plate here. Traditionally used in wedding celebrations, the Loving Cup is a perfect way to celebrate the 70th wedding anniversary of Queen Elizabeth II and the Duke of Edinburgh. 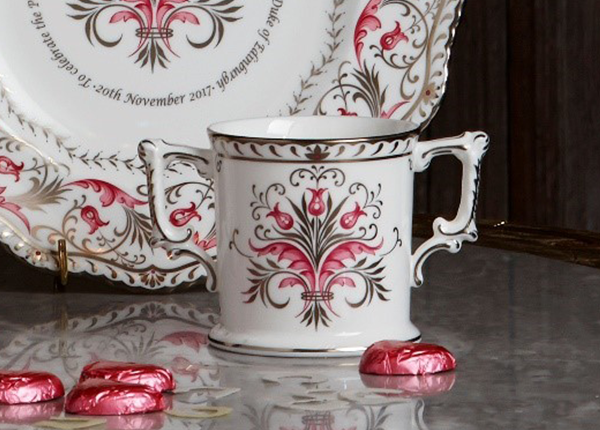 This wonderful commemorative piece features a beautiful pattern adapted especially for the Platinum Wedding Anniversary Commemorative Collection from the original Princess pattern designed by Royal Crown Derby and presented to the Queen and Prince Philip on the occasion of their marriage in 1947. Stunning blush pink buds intertwine with flowing vines and leaves in delicate platinum detailing in a regal centrepiece design befitting a royal celebration. Inspired by the original flora and fauna motifs on the Princess pattern and the floral designs which were prevalent throughout the Queen and Prince Philip’s wedding including design inspiration taken from the wedding dress and wedding cake. Flourishes of the specially tailored pattern create a spectacular swirling border around delicate script celebrating the 70th anniversary of the Royal couple. Striking platinum highlights adorn the Loving Cup’s handles and is used throughout the pattern to create breath-taking detailing, referencing to the traditional precious metal used to celebrate 70th wedding anniversaries in Britain, making it a truly special commemorative piece, celebrating a land mark occasion for Queen Elizabeth II and Prince Philip. View The Queen’s Platinum Wedding Anniversary Commemorative Collection Loving Cup here. This year, Queen Elizabeth II and the Duke of Edinburgh celebrate the 70th anniversary of their marriage. To mark this landmark occasion Royal Crown Derby are proud to announce the launch of The Queen’s Platinum Wedding Anniversary Commemorative Collection included in this very special collection is the Five Petal Tray. A specially adapted pattern from the original Princess pattern designed in 1947 by Royal Crown Derby and presented to Queen Elizabeth II and the Duke of Edinburgh on the occasion of their marriage, adorns the beautiful Five Petal Tray, a popular gift item for such occasions. Stunning blush pink buds intertwine with flowing vines and leaves in delicate platinum detailing flow elegantly around the very special piece taking inspiration from the original Princess pattern and the floral designs which were prevalent throughout the Queen and Prince Philips wedding including design inspiration taken from the original wedding dress and multi-tiered wedding cake designs. Beautiful detailing and delicate script in platinum celebrating this landmark occasion adds a wonderful finishing touch, with reference to the traditional precious metal used to celebrate 70th wedding anniversaries in Britain. 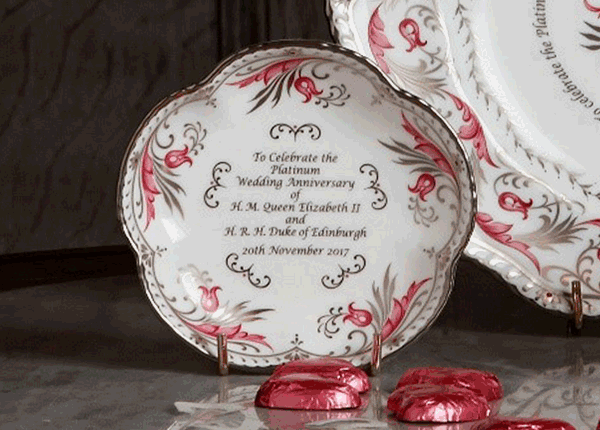 View The Queen’s Platinum Wedding Anniversary Commemorative Collection Five Petal Tray here. 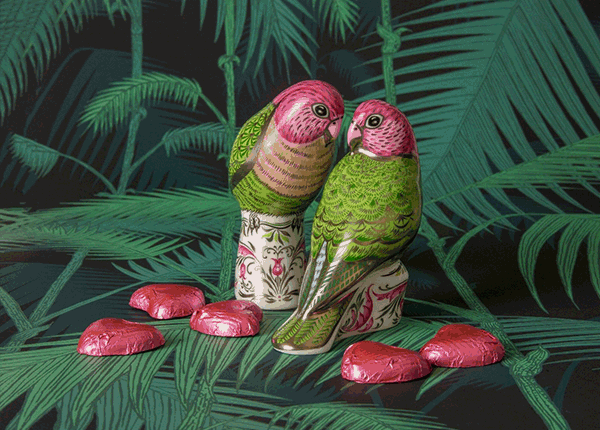 The limited edition Majestic Love Birds are the epitome of a loving couple, named for their committed pairings and the long periods of time the birds sit together as pairs. What better way to celebrate the landmark occasion of Queen Elizabeth II and the Duke of Edinburgh’s 70th wedding anniversary than with Royal Crown Derby’s pair of striking Majestic Love Birds. The Majestic Love Birds in shades of pink and green sit upon a perch adorned with a specially tailored pattern, adapted from Royal Crown Derby’s Princess pattern designed in 1947 to present to the Queen and Prince Philip on the occasion of their marriage. Beautiful pink blooms swirl around the perch with stunning platinum detailing, intertwined into the design are the Royal couple’s initials ‘E’ on the female bird and ‘P’ on the male bird making the Majestic Love Birds a wonderful pair to behold. Feather detailing in blush pink and vibrant green tones embellished in platinum; the traditional precious metal gifted in Britain to couples on their anniversary bring these commemorative pieces to life. Designed to snuggle together as the birds do in nature they bring romance and love, symbolised on this truly special celebratory wedding anniversary for the Queen and Prince Philip to life. A perfect gift of luxury. View The Queen’s Platinum Wedding Anniversary Commemorative Collection Majestic Love Birds Pair here.